As you know: Drinking alcohol has been a very common habit of people since ancient times. Up to now, this liquid has been an indispensable drink in everyday life. However, it is important to fully understand the benefits and the harms of drinking alcohol. Since the disadvantages of alcohol dramatically outweigh its advantages, it is recommended that you should not drink this kind of liquid. Simply, any drink containing alcohol is called alcohol. Depending on the alcohol content of the drink, people classify this liquid into three categories: distilled alcohol, beer, and wine. Three categories of alcohol drinks : distilled alcohol, wine, and beer. As can be seen, this kind of liquid plays an essential role in social interaction. But alcohol is also known for many negative effects. So, is drinking alcohol good or bad? Let’s check out the benefits of not drinking alcohol and have your own answer! Several studies have shown that stopping drinking alcohol has positive effects on both physical and mental health. Here are 8 great benefits you will get when you break this drinking habit. Many of us think we sleep better after having a few drinks. Some even think drinking alcohol lets them sleep more easily. Indeed, you will fall asleep probably faster, but the quality of your sleep will not be decent. Alcohol disrupts phases 3 and 4 of your sleep, even if you are an occasional drinker. According to a study on alcoholism published by the University of Melbourne in 2015, alcohol is likely to interfere with sleeping. This liquid causes sudden awakening and frustration at night. When drinking alcohol, it is common that you are prone to insomnia. Consequently, stress and drowsiness may occur during the day. Not drinking improves the quality of your sleep at night. ​Meanwhile, sleeping without alcohol prevents you from having heavy head when getting up in the morning. If you are an alcohol addict, attending an alcohol outpatient is highly recommended. Getting rid of this habit will improve your sleep and help you spend the day full of energy. In the presentation by the University of Melbourne, it is written that as soon as you quit drinking, the quality of your sleep is enhanced. But in my opinion, not all people are like that. It seems to depend on each individual. When you drink alcohol, it is difficult for the internal organs to decompose nutritions. Alcohol abuses the liver to decompose this type of liquid. People who take in alcohol for a long time have a higher probability of having an alcoholic liver. This can even lead to more serious disease such as liver cancer. ​As can be seen, not drinking alcohol reduces the burden on the internal organs, which leads to the improvement of your health. This statement is scientifically proven by a result of a health examination. This is a considerable benefit of not drinking alcohol. It is obvious that you can save money if buying water or carbonated water instead of alcohol. In order to decompose alcohol, your body will ask for carbohydrates such as noodles. Therefore, drinking alcohol increases calorie intake. 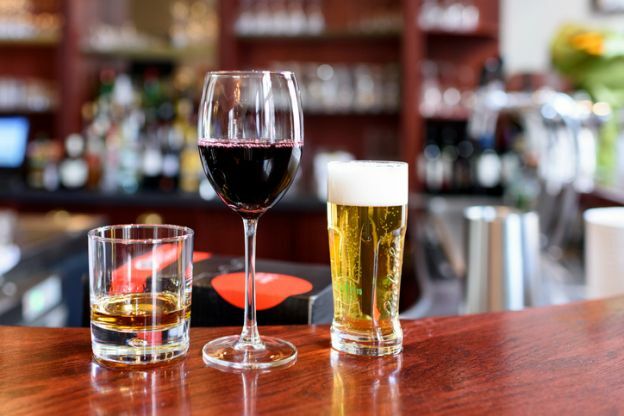 According to some researches in alcoholism, drinking alcohol may amplify drinkers’ perception of appetite, which increases their desire for food. Now that if you do not drink alcohol, that kind of "appetite you cannot control" will not spring up. A glass of beer or wine contains up to 150 calories. Getting rid of alcoholic drinks reduces our calorie intake, which can obviously leads to weight loss. Add up all the glasses taken in the week and the total number of "empty" calories absorbed is impressive. Compared to alcohol drinkers, those who drink other liquids will have a lower blood glucose level. You will also maintain good cholesterol level and have higher melatonin rate in your body. Your liver also regenerates better if you do not fill it with alcohol drinks. Without alcohol, your immune system is also much stronger, which repels germs and diseases. Drinking alcohol dehydrates all the organs of the body. So if you cut down on your alcohol consumption to the least, you will be better hydrated. For women who are trying to get pregnant, completely quitting alcohol increases their chance of success. Meanwhile, for men, avoiding alcoholic drinks reduces the risk of erectile dysfunction. Not drinking alcohol will keep your concentration at its best. You will be more creative since your ideas will be clear at all times. Compared to alcohol drinkers, you have a better mood and more energy throughout the day. Not drinking will also make your memory and concentration ability better. In addition to this, for those who drive, be aware that one of the main causes for serious accidents on the road is drunk driving. Since you are in full possession of your faculties, you are less likely to make fun of yourself in public because of the effects of alcohol. Not drinking alcohol also allows you to have good judgment at all times. Besides, your anxiety level will be decreased. You will be aware of everything you did the day before, so there would be less unpleasant surprises. What’s more, without alcohol absorbed in your body, your days seem to go faster. This is because you are more motivated and especially more focused. Not drinking alcohol will let your body recover much faster after physical activity. In case you have been a long-time alcohol drinker, getting rid of this habit will let your body begin to recover. Your organs in particular and your overall health in general will improve within a few months. Without alcohol, it is also easier for non-drinker to develop their muscles. Especially, if you want to get good results in the gym, avoiding alcohol is a necessity. More or less, drinking alcohol has some bad effects on both your mental and physical states. Therefore, it is highly recommended to use other healthy drinks instead. Not drinking alcohol partly makes your life healthier and happier. Once you are aware of the benefits of not drinking alcohol, you will have the natural motivation to maintain a sober life. Therefore, you can enjoy a happy refreshing life with family and friends. Well, with many great benefits of not drinking alcohol mentioned above, we hope you will be fully aware of the need to control the amount of alcohol you drink. Remember it is even better to quit this habit completely.